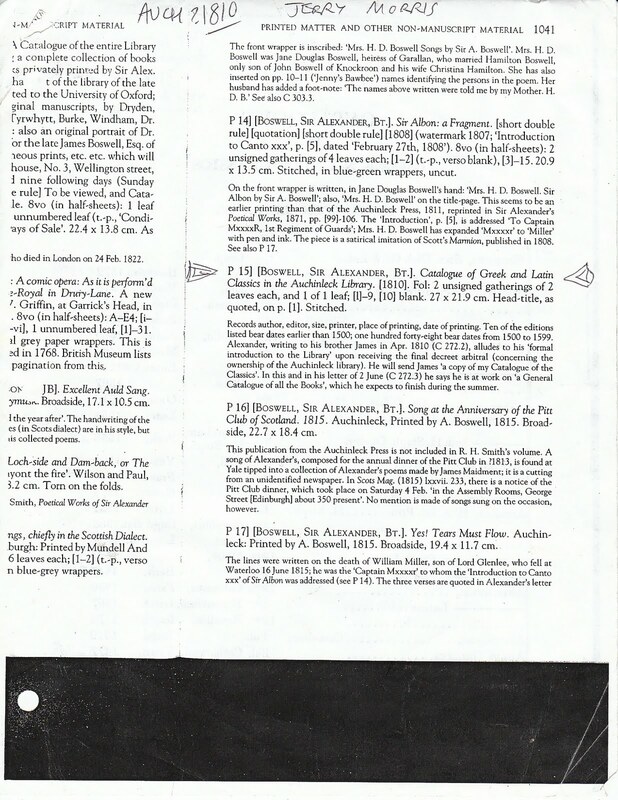 When James Boswell died in 1795, he left the affairs of his estate in sad order. It wasn't until almost fifteen years later that Sir Alexander Boswell received the final decreet arbitral concerning his ownership of the Auchinleck Library. 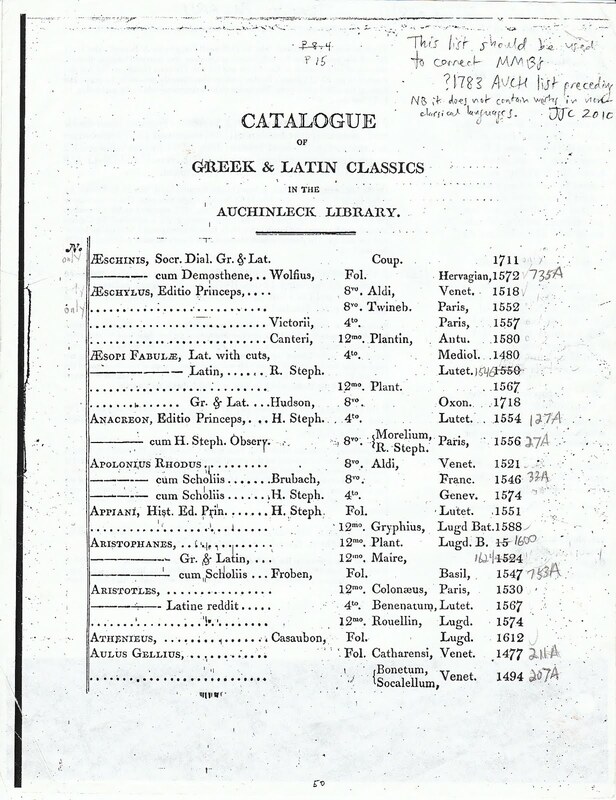 In 1810, Alexander catalogued the Greek and Latin Classics in the library. 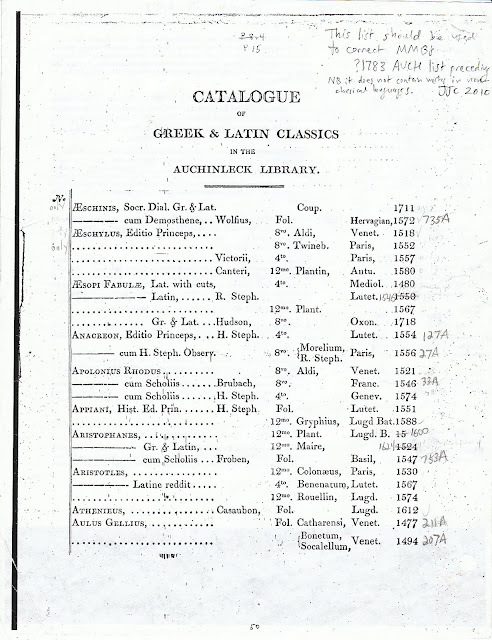 With his Auchinleck Press, he printed copies of the Catalogue of Greek & Latin Classics in the Auchinleck Library, and sent his brother Jamie a copy. He also told his brother that he was working on a general catalogue of the entire Auchinleck Library. There was no date or imprint on the nine-page catalogue of the classics, but John Martin recorded it in his book, A Bibliographical Catalogue of Books Privately Printed; Including those of the Bannatyne, Maitland and Roxburghe Clubs, And of the Private Presses at Darlington, Auchinleck, Lee Priory, Newcastle, Middle Hill, and Strawberry Hill, London, 1834. Martin also reported that Alexander Boswell printed a general catalogue of the Auchinleck Library, containing 111 pages, but most of the copies were destroyed because Alexander Boswell never completed the catalogue. In February 2010, James Caudle, Associate Editor of the Yale Editions of the Private Papers of James Boswell, contacted me after reading my note in the September 2009 issue of the Johnsonian News Letter. I had informed Johnsonians and Boswellians that we were cataloguing the libraries of Samuel Johnson and James Boswell on Library Thing. James Caudle made our work more expansive, providing me with several catalogues and lists of books formerly owned by the Boswells. One of them was a copy of the Catalogue of Greek & Latin Classics in the Auchinleck Library. I recently completed the cataloguing of the 279 290* works listed in this catalogue. The listings can be viewed on Library Thing. I invite Boswell lovers, and especially the people who catalogue books for a living to review my work, and inform me of any errors in my research so I can correct them. I have yet to modernize the latin place names or standardize the spelling of the names of the authors. Of the 279 290* works listed in the 1810 Catalogue, at least 75 of the them were sold during the 1893 Auchinleck Sale. Another five works were sold during the 1916 Sotheby Catalogue. Auction lot numbers are annotated in the right-hand column, with "A" denoting the works sold in the 1893 Auchinleck Sale, and "S" denoting the works sold in the 1916 Sotheby Sale. Edinburgh University Press; New Haven: Yale University Press, 1993). 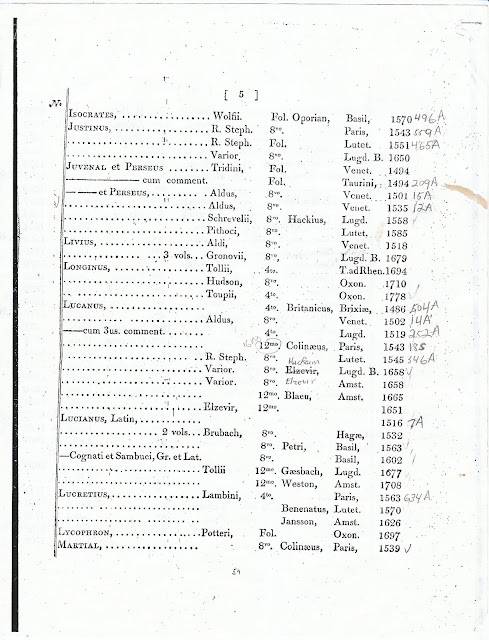 The 1810 Catalogue is nowhere near perfect. Hardly any of the titles are provided. And some of the dates and places of publication are inaccurate–or at least they appear to be inaccurate. Some of them could be, as James Caudle cautioned, "ghost editions." I've annotated my corrections in the catalogue below. Please contact me if you believe any of my corrections are flawed. P1 Aesop Latin R. Stephanus Lutet. 1550 Should be 1546. P1 Aristophanes Plant. Lugd. Bat. 15 Should be 1600. 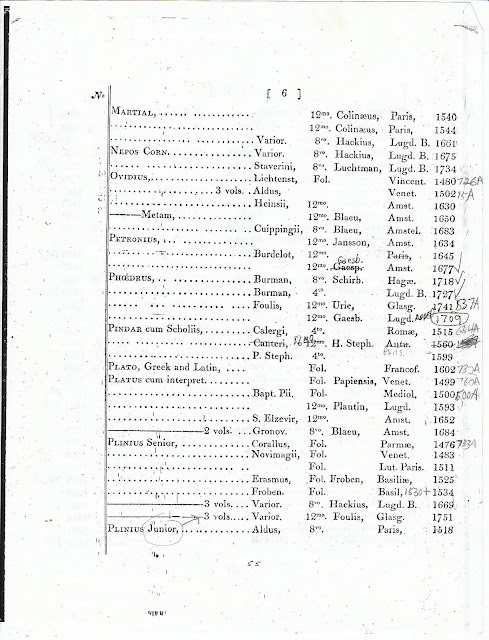 P1 Aristophanes Maire 1524 Should be 1624. P2 Ausonius Scaligeri Heidelb 1688 Should be 1588. P3 Claudianus Heinsius Elzevir Lugd. P. 1665 Should be Amsterdam. P3 Dion Cassius Oporinus Basil 1557 Should be 1558. 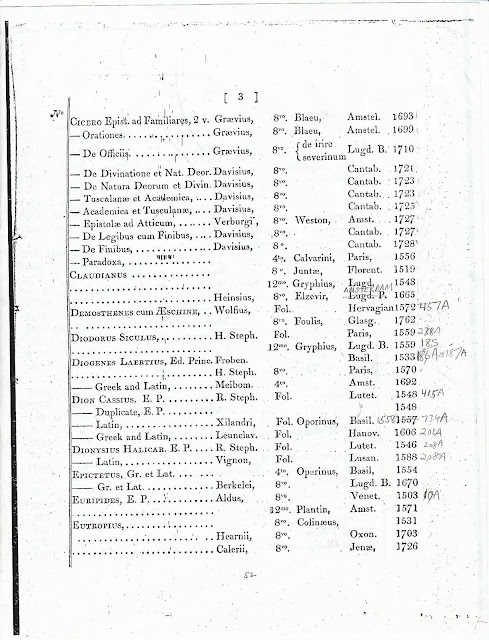 All bibliographical records on Page 4 appear to be correct. P5 Lucanus Elzevir Lugd B. 1658 Should be Hackium. P5 Lucanus Amst. 1658 Should be Elzevir. P6 Pindar H. Steph. Antw. 1560 Could be Paris. P6 Plinius Senior Froben. Fol. Basil 1534 Could be 1530. 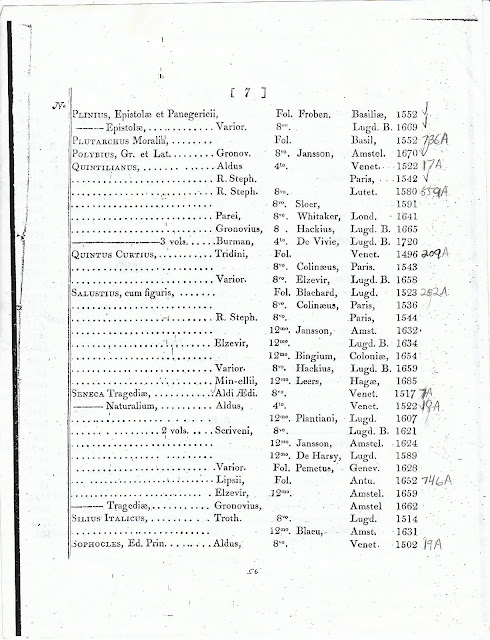 All bibliographical records on P7 appear to be correct. P8 Statius Ed. Prin. Fol. Romae 1475 Could be Venice 1483. P8 Suetonius Jansson Amstel. 1531 Could be 1631. P8 Suetonius R. Steph. 1533 Could be Paris 1543. P8 Terentius R. Steph. 4to Paris 1531 Could be 1541. P8 Terentius R. Steph. 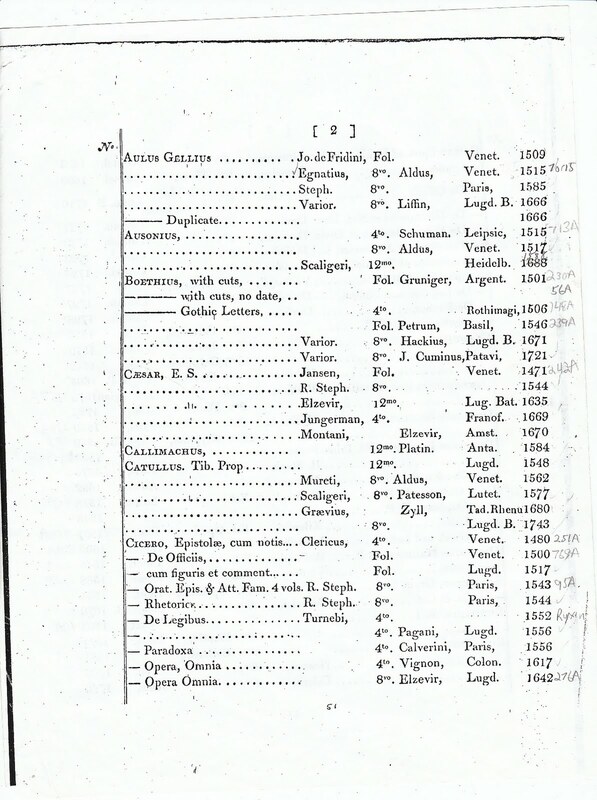 Paris 1740 Could be 1540. P8 Theocrites 8 vo Oxon. Could be 1699. P9 Virgilius 12mo Gryphius Lugd. 1572 Could be 1592. P9 Virgilius H. Steph. 8vo no date Could be Geneva 1576. Thanks again to James Caudle and Yale University for enabling us to catalogue another portion of the Boswell Library for viewing on Library Thing. My friend, Per Ralåmb, Proprietor of Rosenlund Rare Books & Manuscripts in New Jersey, and a collector of early printed books reviewed my corrections, using three bibliographies I was unfamiliar with: Schweiger, Renouard, and Brueggeman. His research recorded below is already included in the respective Library Thing listings. P1 Aesop Latin R. Stephanus 1550. This is should be, as you indicated, the 1546 edition in 4to though it was printed in Greek and not Latin. The only 1550 Latin edition was printed in Basel. P1 Aristophanes Plant. Lugd. Bat. 15 . This is, as you mentioned, the 1600 Plantin edition. P1 Arsitophanes Maire 1524. This is the Scaliger edition of 1624. By the way, in order for this edition to be complete, it must contain the 56p of the Fragments which is sometimes missing. P2 Ausonius Scaligeri Heidelb 1688. This is correct. Should be the 1588 Heidelberg edition. P3 Claudianus Heinsius Elzevir Lugd. 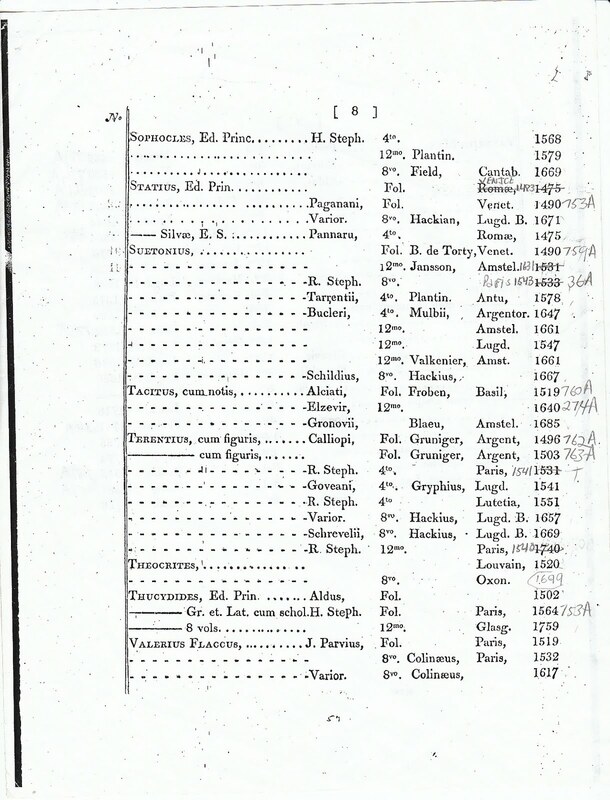 P. 1665. Should be Amsterdam. P3 Dion Cassius Oporinus Basil 1557. The preface is dated November 1557, but the printed title page is dated 1558. P5 Lucanus Elzevir Lugd B. 1658 The Hackius edition was printed in Leyden and the Elzevier in Amsterdam. P6 Pindar H. Steph. Antw. 1560. Printed in Paris by the Estienne Press. P6 Plinius Senior Froben. Fol. Basil 1534 . Froben printed one edition in 1530 and another 1535. P8 Statius Ed. Prin. Fol. Romae 1475. Schweiger mentions a 1475 edition printed in Rome. P8 Suetonius Jansson Amstel. 1531. This is tricky because there are a few choices, but no 1631 Amsterdam edition by Jansson in Schweiger. There is by Jansson a 1621 Amsterdam edition listed. P8 Suetonius R. Steph. 1533. Agree. Should be 1543 by Estienne. P8 Terentius R. Steph. 4to Paris 1531. A bit tricky as well. 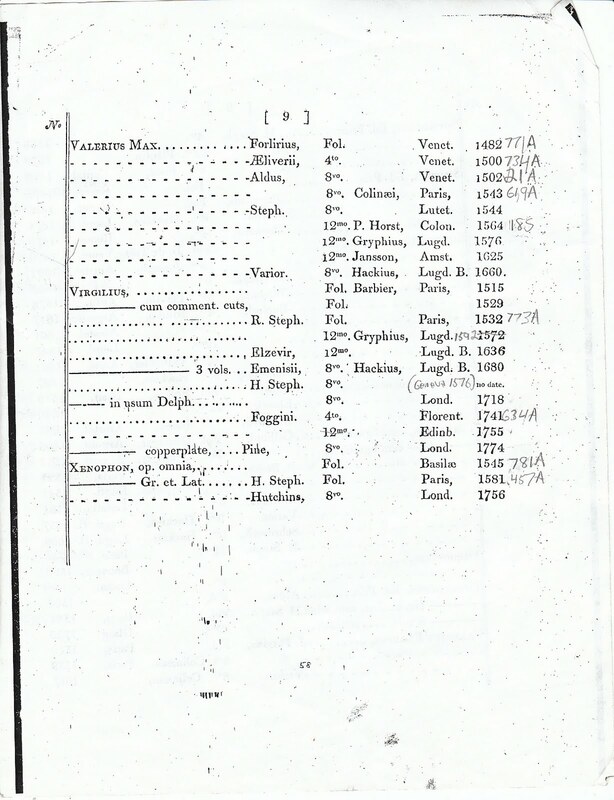 There is an 8vo edition printed in Paris 1531 and a 12mo as well as a 4to edition printed in Paris 1541. My guess, this is the 4to edition. P8 Terentius R. Steph. Paris 1740. There is no Estienne Paris edition of 1540 according to Renouard. So, this should be the Estienne 12mo edition of 1541. Schweiger is a bit unclear, but seems to follow the same flow of editions. P8 Theocrites 8 vo Oxon. Tricky. 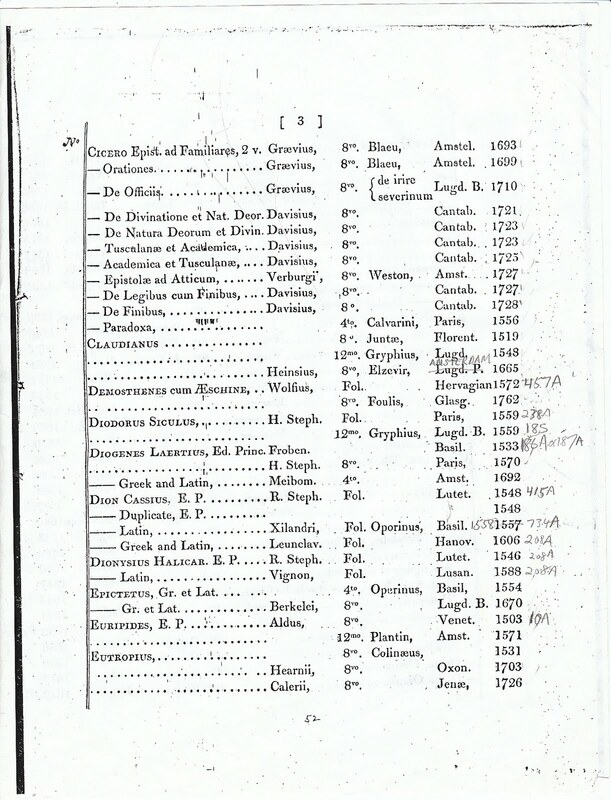 There are in Brueggeman three 8vo editions from Oxford, 1676, 1699 and 1760. There is even a fourth but 4to edition printed in 1770. P9 Virgilius 12mo Gryphius Lugd. 1572 . I agree. 1592. Schweiger lists it as a 16mo. 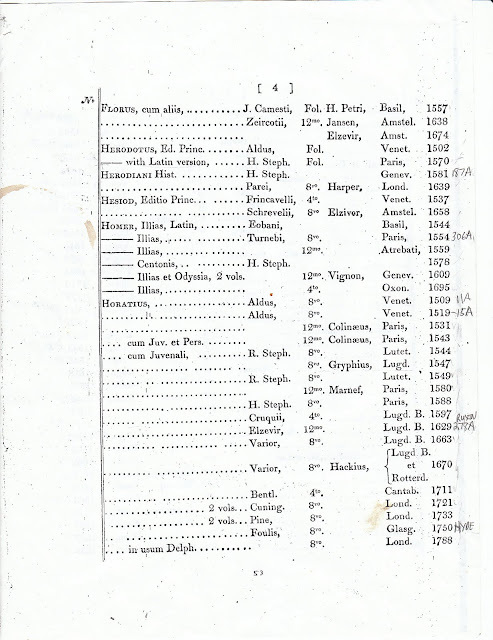 *Update: June 2013 After reviewing Terry Seymour's article in the March 2013 issue of the Johnsonian News Letter, I discovered that I hadn't cataloged all the entries listed in the 1810 Catalogue. Moreover, where there were duplicate copies of a work, only one work was counted by Library Thing toward the total count of the works. I listed all duplicate works separately and identified and catalogued the entries I had missed in 2011. Another impressive offering from Jerry Morris, demonstrating considerable scrutiny & thoughtful assemblage.